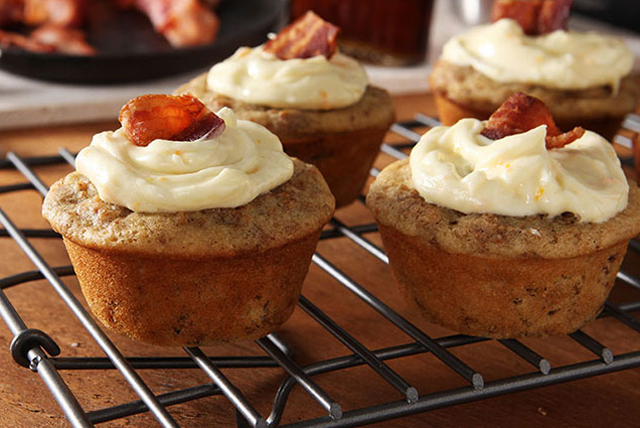 Baffle and delight your family with these baked goods made with bacon and eggs and topped with cream cheese frosting. Are they muffins? Or cupcakes? Combine cereal, milk and syrup in large bowl; let stand 2 min. Mix flour, baking powder and cinnamon until blended. Reserve 1 bacon slice. Coarsely chop remaining bacon; stir into flour mixture. Bake 14 to 17 min. or until toothpick inserted in centres comes out clean. Cool completely. Beat cream cheese, butter, zest and juice in medium bowl with mixer until blended. Gradually add sugar, mixing well after each addition; spread onto cupcakes. Tear reserved bacon slice into 12 pieces; place on tops of cupcakes. Pure maple syrup varies in strength - the darker the syrup, the more maple flavour it will have. If your syrup is light in colour, you can add 1/2 tsp. maple extract to this recipe to increase the maple flavour. Line muffin pan cups with paper liners before filling with batter and baking as directed. Store cupcakes in refrigerator up to 2 days. Remove from refrigerator about 30 min. before serving.